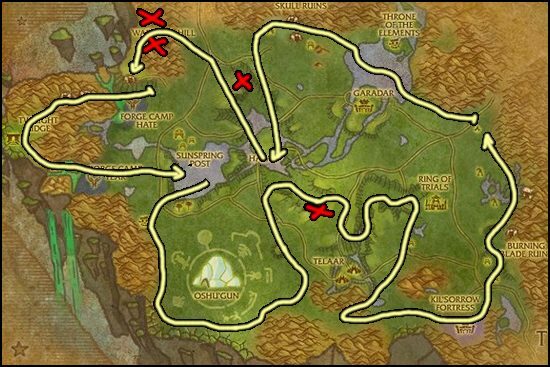 This Adamantite Ore farming guide will show you the best places for mining Adamantite Ore. There are two types of Adamantite Deposit, one if them is the normal Adamantite Deposit and there is also Rich Adamantite Deposit. I must also mention that Khorium Veins are a rare spawn of Adamantite Deposits, much like Truesilver is a rare spawn of Mithril, so sometimes you will find a few Khorium too. Nagrand is the best place to farm Adamantite Ore. I marked a few caves with a red X on the map. You can usually find one or two Adamantite Deposits in those caves so you should go into them. 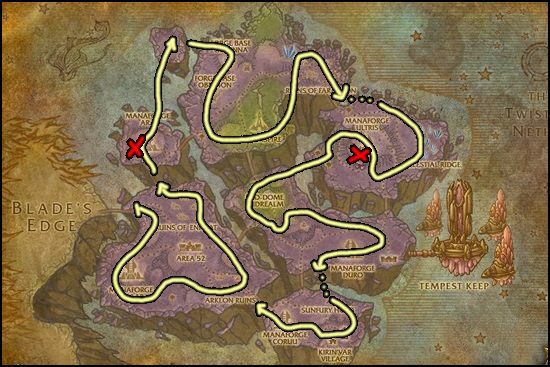 Netherstorm is also an excellent place to farm Adamantite Ore. Just like in Nagrand, I marked two caves with a red X on the map. Once you are done mining Adamantite, go to my Cobalt Ore Farming page!